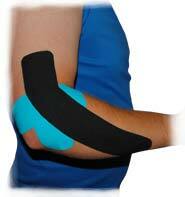 Elbow injuries can be tough to target, but not with our products. It doesn't matter if your injury is located on the inside or outside of your elbow, our products are designed to treat all types of elbow injuries. 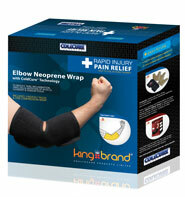 Our products cover pain relief, healing of the damaged tissues and protection from re-injury. We've got what you need for every stage of your recovery. Treat your Golfer's Elbow, Tennis Elbow, Elbow Bursitis, Elbow Sprains and Elbow Strains with our BFST® and ColdCure® Elbow Wraps. They provide complete coverage of the affected area, so you get maximum cooling power or blood flow during your treatments. 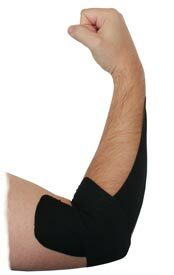 Our Elbow Wraps are custom designed to conform to the unique shape of the elbow, ensuring a comfortable fit. When it comes to relieving pain and promoting healthy blood flow, these products cannot be matched. Take a look at our Testimonials further down the page from customers who've used the Elbow Wraps and had amazing success. I had tendonitis for 10 years in my elbows and tried everything but nothing worked. I used your wraps and it completely healed them. My elbows are now MINT! 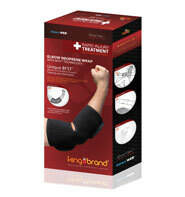 KB Support Tape is exactly what you need to help prevent re-injury between your BFST® and ColdCure® treatments. It's also ideal for providing your tissue with additional support and protection during physical activity. KB Support Tape can be worn during all of your daily activities without getting in the way or restricting your range of motion. KB Support Tape comes in 2 different sizes: 2 inch wide and 3 inch wide. The 2 inch wide variety is ideal for smaller areas, while the 3 inch wide style is better for larger areas. This also applies to your size. Larger people will prefer the 3 inch wide Tape, while smaller people will prefer the 2 inch wide Tape. The 2 inch wide Tape comes in 4 different colors: Pink, Blue, Black & Beige. The 3 inch Tape is available in Black & Beige as well. There is no difference between the colors, they just allow you to express your personal style. We encourage you to look into various applications for your elbow injury to find the one that works best for you. 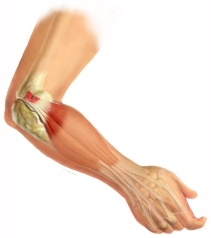 Applications will differ depending on the area of your elbow that's injured and what type of elbow injury it is. There are plenty of examples online. Your product is awesome. It fits my arm perfectly; I am using it now to reduce swelling due to my tennis elbow and will be using it post-surgery for sure. It's amazing! I love it so much. My husband and I were so impressed last night when you took the time to call to find out if we were satisfied with the wrap. 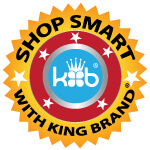 Every ColdCure® and BFST® purchase comes with the additional benefit of having one of our knowledgeable King Brand® Advisors contact you 4 or 5 days after your order has been delivered. This is to ensure you have received your order, find out how your treatments are going, and answer any questions you may have. Our Advisors have been thoroughly trained on ColdCure® and BFST® technology and treatments. They spend all day every day giving people treatment advice and guidance. Our Advisors truly care about your recovery. While one of our Advisors will follow-up with you directly, you are welcome to contact us if you need any support. I am already noticing a lot of improvement with my tennis elbow. I have been suffering since January with this and have tried many different things. Your products are the only things that have seemed to work. I am very impressed!